Fisherman work the waters at Grand Isle, La., on Saturday as Tropical Depression Bonnie approaches the coast. NEW ORLEANS  Crews hurried to get back to work plugging BPs leaky oil well Saturday after Tropical Storm Bonnie fizzled, and engineers hoped for a window of clear weather long enough to stop the gusher for good. But with peak hurricane season starting in early August, chances are the next big storm is right on Bonnies heels. Were going to be playing a cat-and-mouse game for the remainder of the hurricane season, retired Coast Guard Admiral Thad Allen said Saturday. Sure enough, another disturbance already was brewing in the Caribbean, although forecasters said it wasnt likely to strengthen into a tropical storm. In the last 10 years, an average of five named storms have hit the Gulf each hurricane season. This year, two already have struck  Bonnie and Hurricane Alex at the end of June, which delayed cleanup of BPs massive oil spill for a week even though it didnt get closer than 500 miles from the well. Bonnie fell apart Saturday before it even reached the Louisiana coast. By then, worries about the storm had pushed back efforts to solidly seal the well by at least a week, said Allen, the governments point man on the spill and a veteran of the Coast Guards rescue mission after Hurricane Katrina. Completion now looks possible by mid-August, but Allen said he wouldnt hesitate to order another evacuation based on forecasts similar to the ones for Bonnie, which halted work Wednesday. We have no choice but to start well ahead of time if we think the storm track is going to bring gale-force winds, which are 39 mph or above, anywhere close to well site, Allen said. Even though the evacuation turned out to be short-lived, it revealed one important fact: BP and the federal government increasingly are sure that the temporary plug that mostly has contained the oil for eight days will hold. They didnt loosen the cap even when they thought theyd lose sight of it during the evacuation, although in the end, the real-time cameras that have given the world a constant view of the ruptured well never stopped rolling. Ironically, the storm may even have a positive effect. Churning waters actually could help dissipate oil in the water, spreading out the surface slick and breaking up tar balls, said Jane Lubchenco, leader of the National Oceanic and Atmospheric Administration. I think the bottom line is, its better than it might have been, Lubchenco said. 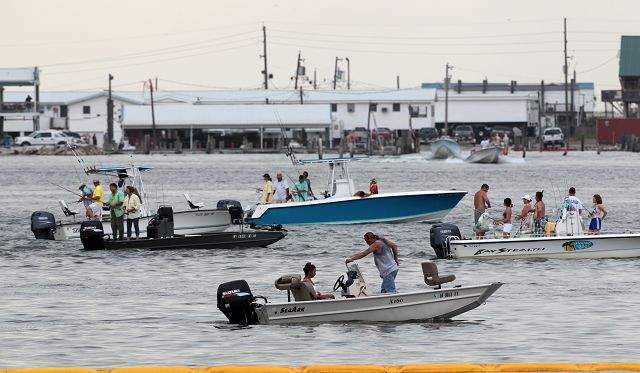 Heavy rain and frequent lightning interrupted a benefit concert on the tiny resort island of Grand Isle off the southeast Louisiana coast, sending those attending scrambling for the limited space under tents set up on the beach. But the rain didnt seem to bother all of the thousands attending the event, which raised money to benefit civic projects on the island with performers including LeAnn Rimes and Three Dog Night. Some wrapped themselves in plastic, putting grocery bags on their heads and dancing throughout the storms. On a day like this, a little rain feels very good, said Doug Matheson, 45, from New Orleans. The rig drilling the relief tunnel that will blast mud into the broken well to permanently seal it started steaming back toward the well 40 miles off the Louisiana coast on Saturday morning. An Associated Press reporter reached the captains telephone line on the vessel Saturday afternoon, and the man who answered the phone confirmed the rig was back at the site. He hung up when asked for his name, and a BP spokesman wouldnt immediately confirm the rig was back in place. By Wednesday, workers should finish installing steel casing to fortify the relief shaft, Allen said, and by Friday, crews plan to start blasting in heavy mud and cement through the mechanical cap, the first phase of a two-step process to seal the well for good. BP will then finish drilling the relief tunnel  which could take up to a week  to pump in more mud and cement from nearly two miles under the sea floor. But the clear weather may not hold that long, said Joe Bastardi, Accuweathers chief meteorologist of State College, Pa.
From what Im seeing in the tropics, its like a pot boiling and the lids going to blow off, Bastardi said.